Many of the most significant problems facing social care are primarily driven by a lack of funding, as set out in the previous chapter. Whilst the Care Act remains a widely supported broad legislative framework, more funding is needed to implement it fully. So why has it proved so hard for successive governments to deliver sustainable long-term funding for this crucial service? The answer lies partly in how the public view social care, which is linked to the fact it is complex and hard to understand. Adult social care and support is not free for everyone. An individual who thinks they need support through adult social services is assessed by their council to identify their care needs and determine whether or not those needs are eligible. If they are, a separate assessment is made of the individual’s financial circumstances to determine whether they must contribute to the cost of their care. Two recent reports are extremely helpful in understanding the public’s concerns: a recent Ipsos MORI report on attitudes to social care funding reform, prepared for the King’s Fund and Health Foundation; and a report by public participation charity, Involve, summarising the findings of a ‘Citizens’ Assembly’ they held on behalf of the Health and Social Care Select Committee and the Communities, Housing and Local Government Select Committee. A complex and confusing system: People do not have a detailed understanding of social care services and are unsure about how to access them. Participants with experience of social care said the system was complex, bureaucratic and difficult to navigate. Forty-five per cent of Citizens’ Assembly members selected an ‘easily accessible’ system in their top five principles for a reformed system. Thirty-eight per cent of assembly members put a ‘simple clear’ system in their top five. Complex and unclear funding arrangements: Unless they have experience of it, people have limited understanding of how social care funding works. Most people think social care is funded similarly to the NHS, through tax, or that an entitlement based on National Insurance contributions will be available. People with no or limited experience of social care are largely unaware that the system is means tested. Upon learning this, many are “shocked”, as they had assumed there is a more generous offer for more people. Transparency and fairness: People want more transparency – both in terms of the costs of social care (individually and nationally), and in terms of being able to see where funding for social care is being raised and where it is being spent. On fairness, there are a range of views reflecting the different interpretations of what fairness is. These include fairness to older people who have paid taxes all their lives, fairness in protecting people’s housing assets, fairness between different generations and fairness based on a person’s ability to pay. In respect of private funding, people want an ‘asset floor’ below which an individual would not have to contribute to their care costs, as well as a ‘cap’ on the costs of care beyond which an individual would not have to pay. In terms of public funding, there is broad support for increases to Income Tax, a social insurance scheme (a stand-alone compulsory payment as a percentage of income paid by everyone aged 40 and over), and an extension of National Insurance to people working beyond state pension age. This detailed work helps to explain the many examples of public polls which show that few people understand social care or how the system is meant to work. For instance, a 2017 Ipsos MORI poll suggested 63 per cent of people believed the NHS provides social care for older people, and 47 per cent believed social care is free at the point of need. It is no surprise, given the difficulty of explaining how the existing system works, that governments have struggled to build the political momentum to make proper and long-term improvements to social care funding, when such changes would require tax increases or cuts to other services to pay for it. But that is no excuse. Public and political opinion is changing, and people who need care and support should not be asked to wait any longer. ‘Standing still’ is not an option and never has been. This was certainly the message from the public in the Ipsos MORI and Citizens’ Assembly work. And doing so would impact on people’s wellbeing and destabilise the care and support system as we have set out above. 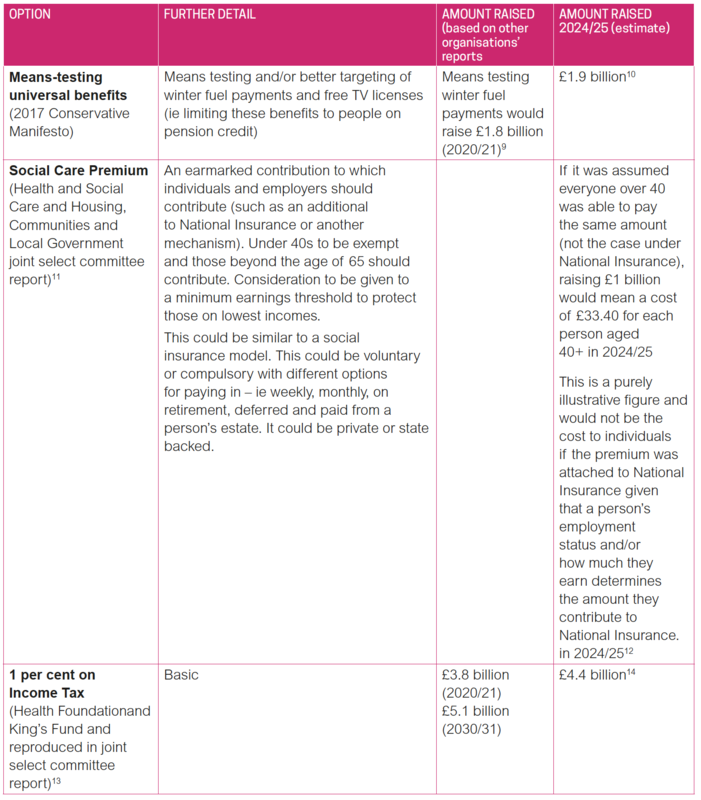 Building on what we know the public thinks, and thinking about some of the consequences of repeated under-funding of social care that we would like to tackle, the following table summarises a range of key options set out in recent papers for how we might change social care for the better. This draws on the excellent recent work by Age UK, the Health Foundation and King’s Fund and the joint select committee report, ‘Long term funding of adult social care’. 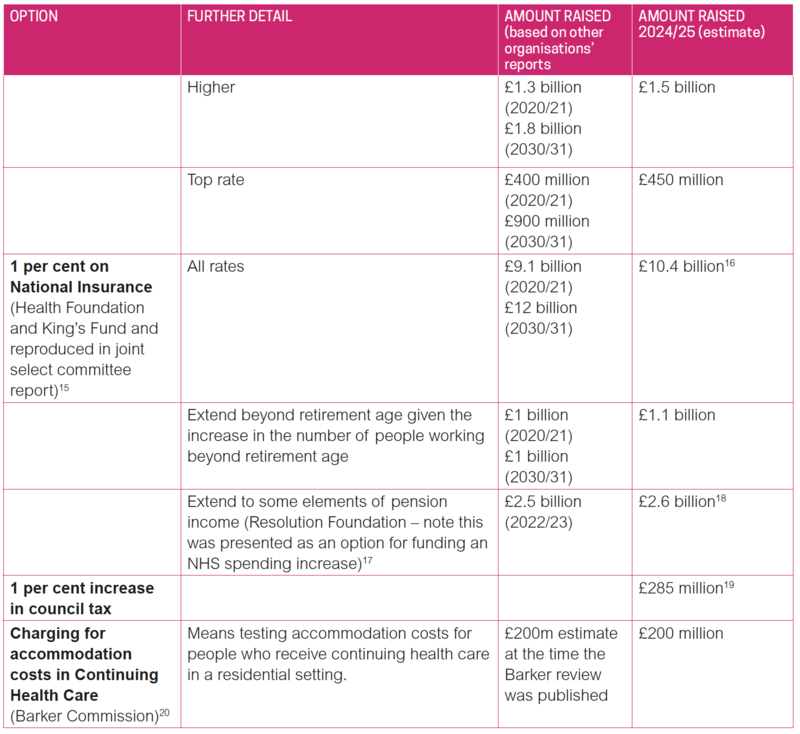 The Health Foundation / Kings Fund and joint select committee those reports compare a range of proposals, along with costings and the table below provides only a summary. For further details please see the links provided. We have not included the option, set out in the Health Foundation and King’s Fund report, of restoring levels of funding to 2009/10 levels. But it is worth noting that they estimate the costs of that at an additional £8 billion in 2021. All of the options below are compared to current funding and, consequently, current levels of access and quality. The options set out in the table do not, in general, overlap, except that free personal care would mean there was no need for a cap on care costs. They would each help different groups, and are not limited to older people; people with life-long disabilities, or working age adults who acquire a disability, require sustainable funding for care and support in their own right. In thinking about how we can make the system better there are two broad categories of changes to consider. The first, shaded in the table below, are primarily about making the current system work as intended and relate to implementing statutory duties fully. These would help stabilise the ‘here and now’, help address the consequences of underfunding as described above, and create a more solid foundation from which to deliver the second, unshaded, options in the table. These are additional proposals for change, which would help address the separate set of concerns identified above that are more to do with notions of fairness, complexity and transparency. They would signal a change to current requirements (although the ‘cap and floor’ would only require implementation of current legislation, not a new Bill). The table projects estimated costs in 2024/25 but in considering the long-term future of adult social care we take a longer horizon; the system we build now must be fit for at least the next decade and beyond. In considering the changes we want to make, the question is therefore not simply about preferences for the short- to medium-term, but for the longer-term as well. None of these options remove the need for continued innovation, improvements in efficiency and practice, and joint working with other local services. Indeed, part of the solution may be an innovation and scaling fund to help drive best practice to a wider audience. Nor should we forget that people exercise responsibility and control over maintaining their own health and wellbeing. They have a right to expect accessible and effective advice, information and support provided by councils, health services and community and voluntary organisations to enable them to make healthy choices and maintain their health and independence. Ultimately, it is the individual’s choice to take the steps towards health and wellbeing, though this will become increasingly important over time to help manage the growing pressures of an ageing population living with more long-term conditions. As set out further in Chapter 5, councils – with their civil society partners – are ideally placed to support people in this process because of their central role in public health and wider wellbeing services. All of the options set out above cost a great deal of money. Despite the fact many people already pay for their own care, even maintaining the current system as it is now will cost more over time due to rising demand and inflation. Current arrangements which pay for publicly-funded adult social care are already complex: mainly resourced through a mix of national government funding (general and specific grants), local government funding (business rates and council tax) and individuals’ own contributions (through charges). The chart below sets this out and excludes self-funders, covering just publicly-funded care. The majority of adult social care funding is not ring-fenced. Increasing public investment in social care will require difficult political choices, especially when they are in addition to the promise of £20 billion a year additional funding for the NHS. But there is public support for this. Recent public polling consistently demonstrates that the British public are proud of the NHS and want to see funding for it increase, even if that means paying more tax. We are starting to see similar consensus on the need for more funding for adult social care. This reflects a shift in public opinion over time about the reality and priority of social care funding. In the latest King’s Fund quarterly monitoring report of changes and challenges facing health and social care, ‘social care’ was selected by NHS trust finance directors as the highest priority for investment of the new NHS funding. 82 per cent of respondents to a 2018 NHS Confederation survey said that they support increasing public spending on social care by 9 per cent a year – compared to 77 per cent who support increasing healthcare spending by a similar amount (4 per cent). In a 2017 Ipsos MORI poll, 71 per cent of respondents said that they would support an increase in income tax to pay for adult social care. In a 2018 Ipsos MORI poll, four out of 10 named community and social care services as one of their top three priorities for any new funding – more support even than for routine surgery and primary care, and outstripped only by support for mental health services and urgent and emergency care. A recent ComRes poll commissioned by the LGA found that 84 per cent of MPs and 81 per cent of Peers agree that additional funding should go to councils’ social care budgets to tackle the funding crisis. Recent LGA public polling suggests that 87 per cent of the public agree that councils should be given additional central government funding to deal with the funding gap in adult social care. A 2018 LGA poll of council leaders and social care cabinet members suggests that 96 per cent believe there is a major national funding problem in this area. 89 per cent said taxation must be part of the solution to securing the long-term sustainability of care and support. There has been considerable helpful recent debate about the different ways additional funding could be raised. They have included taxes on income, on property wealth, and cuts to other public spending. The table below summarises the key proposals which have been set out in public, drawing largely on previous reports, and the amount of money they are estimated to raise. We have conducted work to provide a broad estimate of the amount raised by the different options in 2024/25 (where others’ work uses a different timescale) to ensure consistency between the figures used in the table below and the table above. Some organisations have suggested that Attendance Allowance and other benefits that support the same group of people, could be reformed. For instance, the Barker Commission proposed repurposing Attendance Allowance as part of a new ‘care and support allowance’ to help meet lower levels of need. It could also be means tested. Roughly £5.5 billion a year is spent on Attendance Allowance, although some people spend their allocation on their care needs and others are charged against it so the full amount would not be in scope. More broadly, some people may argue that reprioritising Government expenditure is called for and it is of course in the national interest that we root out tax avoidance to ensure the Exchequer has the full extent of revenue it is owed by individuals and organisations. HMRC estimate that more than £30 billion of tax goes uncollected each year. The default position, if additional funding is not raised by the above options or others, would be continued cuts to other local council services to protect adult social care, as we have described above. The LGA is not suggesting a preferred option. However, we are clear that a mix of solutions is likely to be required, both to reflect the scale of the funding challenge we face, which will continue to grow over time, and to reflect different individuals’ and different generations’ particular circumstances. Wellbeing: do the solution/s help advance the core aims of improving and supporting people’s wellbeing, putting the individual at the centre of their care and support, and investing in the social and economic outcomes of our communities? Fairness: to what extent, and in what ways, do the solution/s help achieve a greater level of fairness for people? Do we understand the overall impact of the whole package of changes on different groups? Sufficiency: how much does the proposed solution/s raise in the short, medium and long-term? How does this compare to the costs of the type of options for change set out above? Sustainability: can we be confident that the funding is sufficient over time? If it is sufficient on day 1, will it be sufficient on day 2, day 100, day 1,000, and so on? Clarity and transparency: are the solution/s easy enough to understand and will they allow for clear lines of accountability on spending decisions? Subsidiarity: can national-level reforms be led as close to the individual they are designed for as possible? Potentially difficult reforms to deliver a sustainable and fully funded care system in the future stand a greater chance of success if they are built on a degree of political consensus which can deliver cross-party co-operation, particularly in a parliament with a narrow majority. Creating a constructive space in which the real issues and the full range of possible solutions can be debated could pave the way for a shared and concerted effort to raise awareness of social care with the public. This might include, for instance, an agreed cross-party narrative on why adult social care matters, how the system works, the challenges it faces, the level of funding required in the sort, medium- and long-term, and the types of options that are most likely and realistic to raise that level of funding. This is not an impossible task. The recent joint report on long-term funding for adult social care by the Health and Social Care and Housing, Communities and Local Government select committees was a coming together of 22 MPs across four political parties. They reached consensus – not just in terms of articulating the problem but also in identifying, and crucially backing, a set of solutions for a way forward. Through this process, the LGA is seeking to develop a similar position, with similar cross-party support. comparator set of organisations; and measure attitudes towards local government funding and powers. We take the estimate as put forward by the Health Foundation and King’s Fund (see 61) and uprate it by OBR forecasts for CPI inflation. For illustrative purposes only, we take a figure of £1 billion and divide this by ONS projections for people aged 40+ in 2024/25. In practice there are many different ways to approach this option, and this cost illustration is intended to give an indication of likely average costs. For Income Tax estimates, we take the 2020/21 estimate as put forward by the King’s Fund and Health Foundation, and uprate it on the basis of OBR forecasts of income tax take (themselves extended using the long term average rate of growth to get to 2024/25). In effect this is a 1p increase in the rate, not a 1 per cent increase in income. For National Insurance, we take the 2020/21 estimate as put forward by the King’s Fund and Health Foundation, and uprate it on the basis of OBR NIC revenue forecasts (themselves extended to get to 2024/25 as above). In effect this is a 1p increase in the rate, not a 1 per cent increase in income. We assume pensions rise with inflation. Councils with responsibility for adult social care are only raising around £23 billion in council tax this financial year. 1 per cent of this is £230m. We uprate this in line with expected growth in council tax income so that we apply the 1 per cent to the expected tax base in 2024-25. A deferred payment is an arrangement in which a council will (subject to eligibility criteria) pay for an individual’s care home costs and recover those costs at a later point once the person’s home is sold. Attendance Allowance helps with personal support costs if you have a physical or mental disability and are aged 65 and over. It is paid at two rates, depending on the level of care you need (£57.30 or £85.60 a week). Unlike social care, it is not currently means-tested.